Anything new that could help? xanathon wrote: Anything new that could help? I take it your are logged in with your unity account? 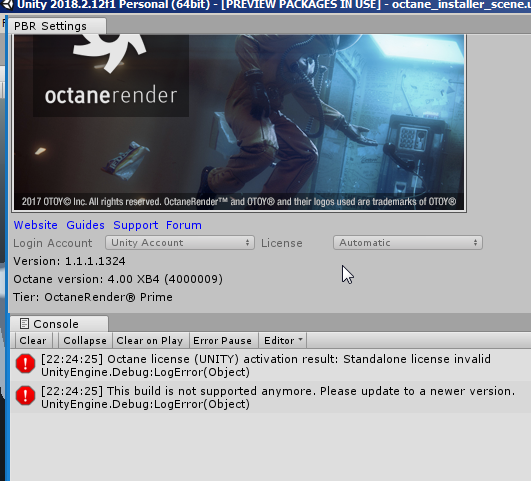 In the Octane Settings window, is your Login Account set to "Unity" and your license to "Automatic" or Prime? Could you show us a screenshot of your Octane Settings window? If I try to login in the Octane PBR-window with the Octane account (clicking "Load Octane") I get the "unlicensed" popup. If I try to login with my Unity account nothing happens and I get the above mentioned error message in the console. If you mean by "logged in" if I am logged into the Unity engine, the answer is yes. I tried "automatic" and "Prime", same result. This cannot be a temporary server issue, as the problem still persists, just checked seconds ago. Unity is allowed to connect to external servers in the Win10 Firewall. Failed: System.InvalidOperationException: Unexpected response from server. Edit: If I cancel the Octane licensing dialog the PBR window says Octane is active (Load button shows "unload") but all Octane menu items are still greyed out. xanathon wrote: If I try to login in the Octane PBR-window with the Octane account (clicking "Load Octane") I get the "unlicensed" popup. If I try to login with my Unity account nothing happens and I get the above mentioned error message in the console. This is quite odd. The response is from the unitys authorization server. We use this to request you for your consent for allowing us to see if your unity account has an octane licence. (Free and/or paid). Could you try with another unity account? Would it be possible for you to PM me your unity account name/email so that we can ask unity what is going on? I think, after suffering through the SketchUp plugin, I might have earned a spot! The stressful nights trying to get a deliverable out for clients with that plug-in lead me to the standalone. Ahh... the stand-alone ... is such a joy! I have a trouble which license activation.